Toast Of The Nation 2016 : A Blog Supreme Hear a playlist of complete jazz concerts from Clark Terry, Snarky Puppy, Anat Cohen, Wycliffe Gordon, Dianne Reeves, Wynton Marsalis and more to ring in the new year. 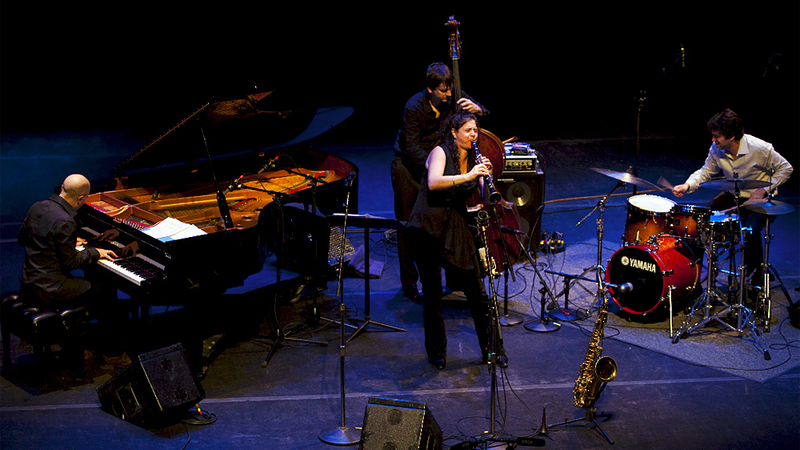 The Anat Cohen Quartet performs in Boston on New Year's Eve 2009. A tradition that dates back to the 1970s, NPR Music presents an all-night broadcast of live jazz performances every New Year's Eve. In a sequence of high-energy concerts, performers counted down to midnight and rang in the new year across four time zones, with performances in Boston; Newport, R.I.; New York City; Chicago; and Northern California. The broadcast featured previously recorded concerts from Anat Cohen, Wycliffe Gordon, Wynton Marsalis, Clark Terry, Snarky Puppy, Dianne Reeves and Allen Toussaint. Hear the performances in the playlist below. Anat Cohen, clarinet/tenor saxophone; Jason Lindner, piano; Joe Martin, bass; Daniel Freedman, drums. Recorded at Berklee College of Music, Boston, Mass., on Dec. 31, 2009. Wycliffe Gordon, trombone; Adrian Cunningham, clarinet/saxophones; Ehud Asherie, piano; Corcoran Holt, bass; Alvin Atkinson Jr., drums/vocals. Recorded at the Newport Jazz Festival, Newport, R.I., on Aug. 1, 2014. Wynton Marsalis, trumpet; Walter Blanding, saxophone; Dan Nimmer, piano; Carlos Henriquez, bass; Ali Jackson, drums. With Jared Grimes, tap dance; Kate Davis, vocals. Recorded at Dizzy's Club Coca-Cola, New York, N.Y., on Dec. 31, 2014. Clark Terry, trumpet/flugelhorn; Red Holloway, saxophone; Willie Pickens, piano; Larry Gray, bass; Charlie Braugham, drums. Recorded at the Jazz Showcase, Chicago, Ill., on Dec. 31, 1989. Dianne Reeves, voice; Romero Lubambo, guitar; Peter Martin, piano; Reginald Veal, bass; Terreon Gully, drums. Recorded at Yoshi's, San Francisco, Calif., on Dec. 31, 2010. Allen Toussaint, piano/vocals; Christian Scott, trumpet; Don Byron, clarinet/tenor sax; Marc Ribot, guitar; David Piltch, bass; Jay Bellerose, drums. Recorded at the Village Vanguard, New York, N.Y., on May 20, 2009.